The Growth Management Plan is a tool used to help direct future growth, protect existing neighborhoods, natural areas, farmland and employment sites, and target areas for redevelopment and revitalization. A well thought-out and consistently supported Growth Management Plan should reduce sprawl, create a more compact and balanced development pattern, support more transportation options and preserve open space and rural character. 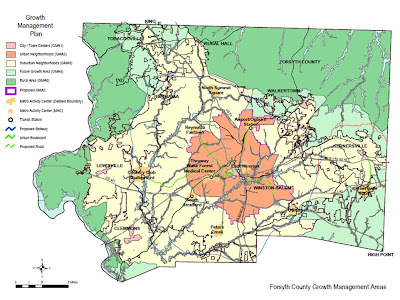 The Growth Management Plan, developed as part of the 2001 Legacy Plan, sets the framework for Forsyth County’s physical development. It provides guidance by identifying where growth should be concentrated based on the goal of making efficient use of our limited land resources. Forsyth County first started using a Growth Management Plan in 1987 with the adoption of Vision 2005. The 2001 Legacy Plan further refined the Growth Management concept and created the Ten Guiding Principles of the Legacy Growth Management Plan with the input of Forsyth County citizens.